Photo contributed by Marc Borom. These beetles may emerge in mid to late spring, sometimes large numbers, and move together in bands crawling or running across the ground. They feed on succulent leaves and flower petals. The larval stages are poorly known, but are subterranean and likely parasitic in nests of ground-nesting bees or grasshoppers. Iron Cross Beetle's conspicuous coloration is related to the fact that they carry cantharidin toxins that can interfere with the vertebrate nervous system - i.e. it is an aposemtic warning. 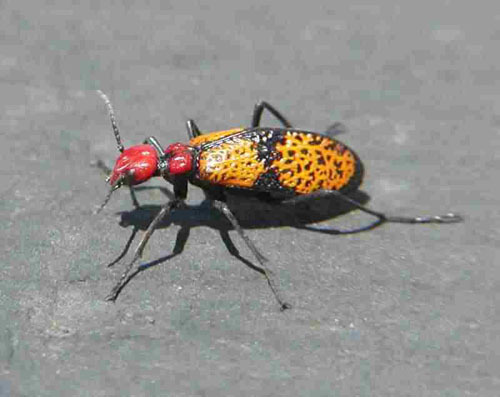 In case you were wondering, you should not eat these insects. Book Reference: Insects of the Southwest by Floyd Werner & Carl Olson. Fisher Books, 1994. 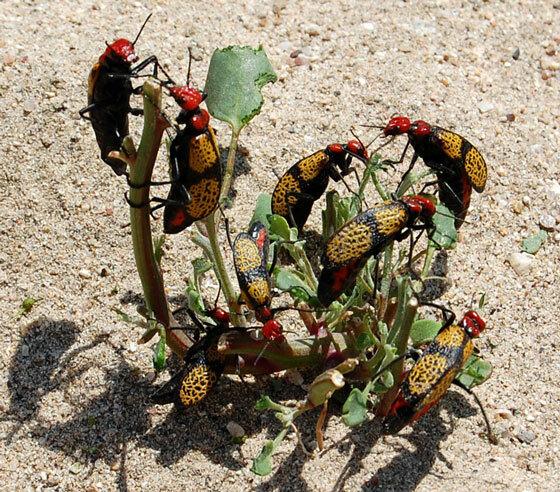 This large emergence of iron cross beetles was photographed in southwestern Yavapai Co., Arizona at Hassayampa Box.